These two Stonehenge chalk plaques form part of the permanent exhibition at the English Heritage visitor centre near the monument and features on their website here. I outlined the background of the discovery of these small objects in my first posting on this blog on 30 January 2014. The above image has been kindly provided by and is © English Heritage. The plaques were buried in a pit 2km from Stonehenge before the sarsen stone monument that we know today had been erected. 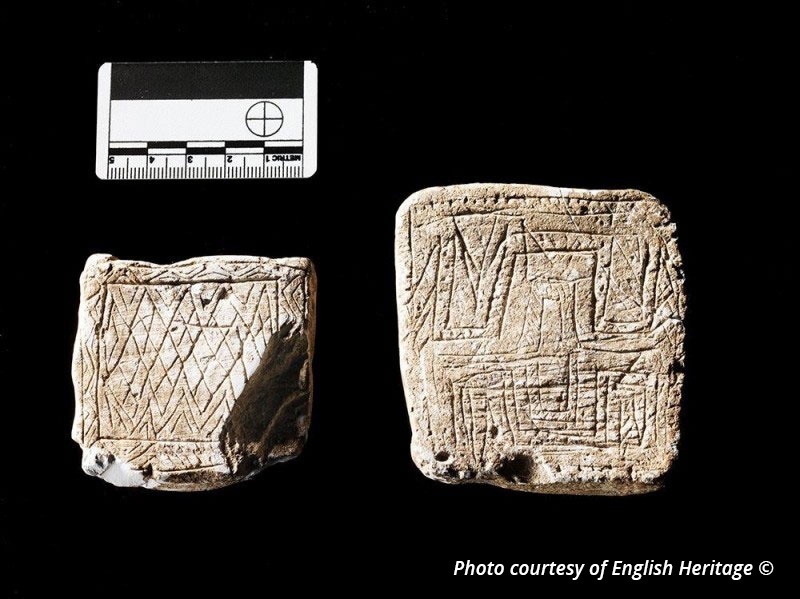 English Heritage have dated the plaques to between 2900BC and 2580BC. In the area around Stonehenge leading up to this time there is evidence of 5600 years of man’s activity already. Mesolithic postholes in the old visitor centre car park 8500BC to 7000BC. Activities at Blick Mead and Vespasian’s camp on the nearby riverbank area of the Avon 7500BC. Robin Hood’s Ball causewayed enclosure 3600BC to 3350BC. Winterbourne Stoke (and other) long barrows 3500BC to 3300BC. Stonehenge Cursus 3400BC to 2600BC. Stonehenge earthworks and cremations 3000BC to 2550BC. Woodhenge at 2400BC falls 180 to 500 years after the plaques were deposited and for international timelines, the pyramids of Giza in Egypt were constructed between 2589BC and 2504BC. Sumerian proto literacy evolved from 3500BC and the first Sumerian written records from Uruk and Ur date from 2900BC. The plaque pit is at ordnance survey reference SU 13124206, so where does that sit in the Stonehenge landscape of 2900BC? West of Blick Mead and Vespasian’s Camp. This is the closest source of fresh drinking water in the Stonehenge landscape for the day to day human practicalities of eating, drinking, washing, cleaning, refreshment, and even relaxing, socialising, etc. On the banks of the River Avon, the lee of Vespasian’s Camp offers natural protection from the persistent prevailing southwesterly winds of Salisbury Plain. South of the eastern half of the Stonehenge Cursus. South of the Stonehenge Avenue. Although the formal construction of the Avenue is likely to date after the period I am considering here, a pathway following this route may have existed at this time and therefore the course of the Avenue can not be ruled out. The plaque pit sits centrally within the above contemporary areas of activity in the Stonehenge landscape of its day. I find it a ‘prima facie’, meaningful “coincidence”, that the plaque pit is directly south of an entrance to the Cursus at SU 131432.This coincidence shouts of a connection between the plaques and the Cursus. Having invested considerable resources in its construction, the Cursus played a significant role in the lives of our ancestors at that time and had been in existence in some form between 500 and 820 years at the time the plaques were deposited in the ground. 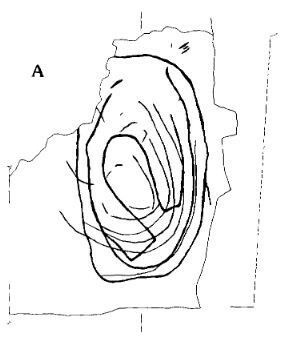 Below is the angular meander on the above chalk plaque highlighted. The angular meander is the image specifically in the upper half of the plaque. Stonehenge is located to the northwest of an almost ox-bow lake meander in the the River Avon. Flagstones Henge is located southwest of a similar meander in the River Frome. Similarly to Stonehenge, Flagstones Henge sat in a Neolithic landscape close to the western bank of a river amongst other prehistoric structures. It is immediately west of Mount Pleasant and east of Maumbury Rings. Simply, ‘The shape of the river at this place is the reason we placed a structure here’. The incisions, pictograms, artwork, doodles, hieroglyphics, linear-angled depictions or whatever term we may choose to rationalise the markings into the language of the present are of considerable sophistication. 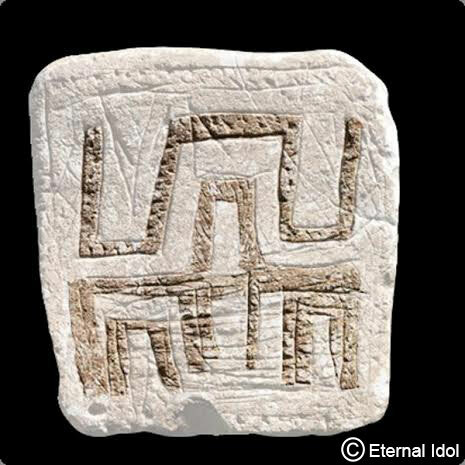 These pictograms could contain imagery of the landscape of Salisbury Plain and Dorchester 5000 years ago, which explains why these particular areas were chosen to devote significant resources to constructing henges, cursuses and other structures. Personally I do not currently agree that the angular meander on the larger chalk plaque above represents a meander in a river. Looking afresh at the incisions in this way, however, has been richly rewarding for me, and I will publish my own thoughts here shortly. A heartfelt thank you to English Heritage and Eternal Idol for two of the images above. A picture is worth 1000 words.